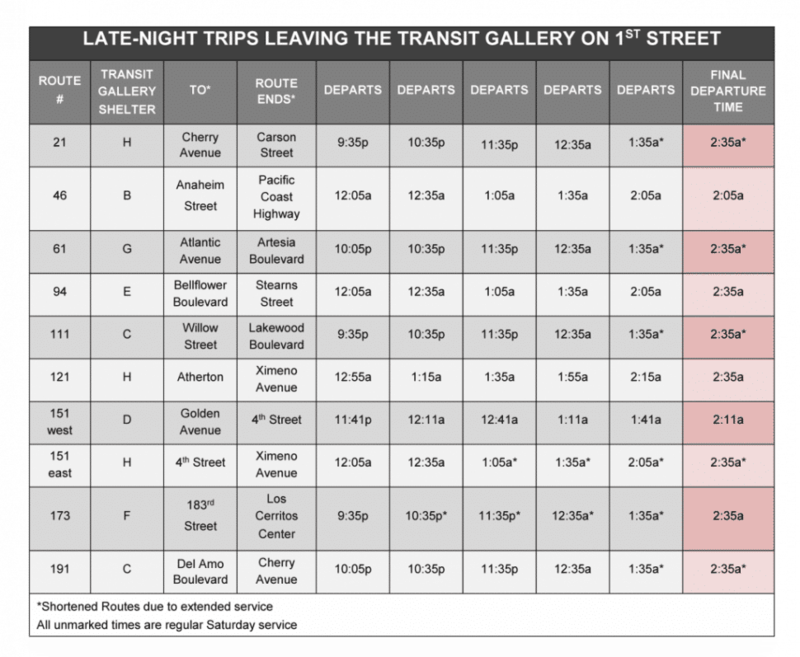 Late-night bus schedule from Long Beach Transit. Long Beach Transit will be offering free rides starting at 5 p.m. on New Year’s Eve extending as late as 2:35 a.m. on Tuesday, with routes leaving from the Transit Gallery on First Street between Long Beach Boulevard and Pine Avenue. No special coupons or tickets will be required, just jump aboard. The annual promotion is aimed at encouraging New Year’s revelers to make responsible plans and take public transit to and from festivities to avoid drinking and driving. A complete list of routes and schedules is available on LBT’s website here or call (562) 591-2301 for route-planning assistance. Averse to phone calls? You can also text LBT for arrival times by texting LBT with your bus stop ID and route number to 27299.